Elias Boudegzdame (14-4-0) smiles brighter with his Brave Combat Federation featherweight championship resting at La Bonne Ecole’s club. He has always stepped into the ring with his menacing smile which earned him the nick name “Smile”. 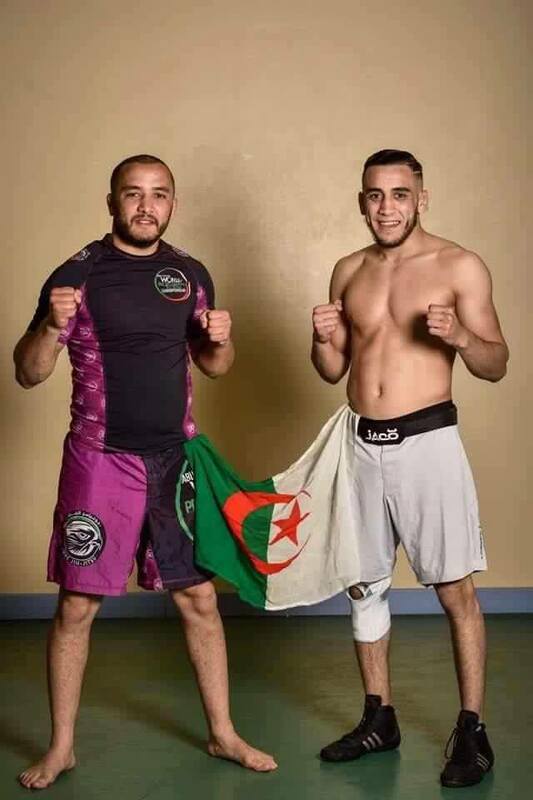 Boudegzdame, the 23 year old Algerian featherweight is riding an impressive 5 fight win streak. The diversity in his submission victories makes him one of the most lethal athletes in the featherweight division. 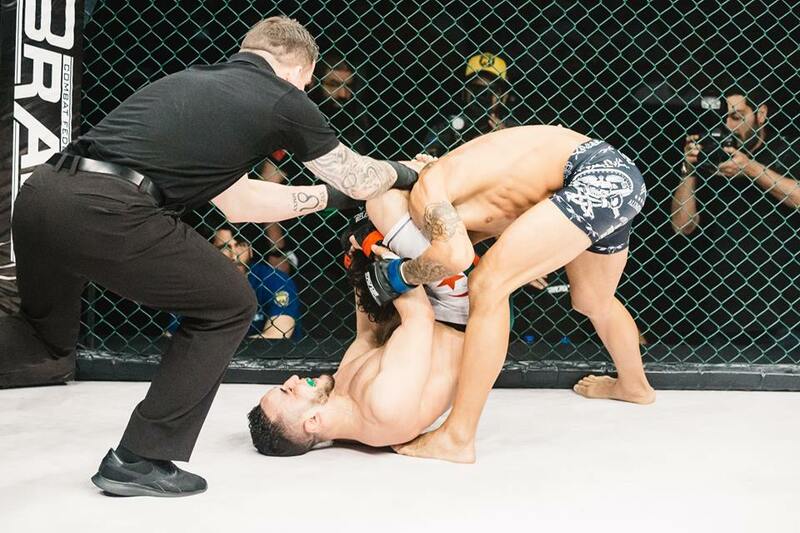 Currently pursued by Lucas Martins Mineiro from Brazil, the two are soon closing in for a championship bout. Mineiro gave no space for Boudegzdame as he walked into the cage, minutes after Elias was crowned world champion, shouting and challenging the champ. And it seems, the promotion is going to make this happen soon. Q : How does it feel to be the first Featherweight Champion in BRAVE COMBAT FEDERATION? A: I am overwhelmed and really happy at this point of life. But there is a burden on my shoulders, the burden of responsibility to fight, represent and live to the best of my abilities since this championship represents excellence. It is the ultimate privilege that I did not disappoint my family, friends and fans who backed me during each stage of life. I need to thank Brave Combat Federation for the amazing experience. The promotion brings you the truly global MMA experience. Bringing athletes from every corner of the world, giving them the best facilities despite their nationality and celebrity status is something unheard of. No one is a favorite, we are all treated the same. This also develops a sense of camaraderie. You cannot compare this with any other promotion. Brave has achieved more with just 6 events than many promotions strive even after 100 events. His Highness Shaikh Khalid himself is also an amateur fighter and does what he speaks to be a leading example. Q : How did your life change after being the BRAVE featherweight champion of the world? A: I still put the same effort and my daily life is the same. But my victory has brought a lot of hope and inspiration to many youngsters up in the streets. This victory strengthened the belief that despite who you are if one puts their heart, goals are achievable. It is good to see your actions making a change in the life of others. I am always surrounded by loved ones who express their support to me every day. Besides, I was pleasantly surprised by the sincere support that the Algerians had for me. My life remains simple, I love simplicity! I love what I do and I do not get tired of practice, MMA is more than a sport, that is a philosophy of my life. Q : What was the strategy against Masio? You almost knock him out, but also almost got knocked out. Can you elaborate about these two particular moments? A: Once you step inside the cage, there is just one objective and that is to emerge victorious. I adjust to the obstacles and overcome them. There exists no thoughts about plans, glory or ego. The sole objective is to prevail and to honor the commitments that we take for ourselves: to be in adequacy with what we are and what we want. I set myself the goal of leaving no other alternative to my opponent than to submit. I took the assault on him but very soon he countered. Meanwhile he showed a much predictable side of his skill set which I had reversed against him. This sport is unpredictable, the outcome of the fight is always a mystery, I searched in myself the reasons why I was there. And those reasons did not leave room for abandonment so I gave everything. Q : During the face off was the moment you were not smiling, tell us about that moment. A: The end of the fight was a rather peculiar moment. What one feels before the fight is intense. There were many thoughts in the head but above all a sense of relief, a kind of appeasement or fulfilment. During this battle, everything went very quickly. And he came out unexpectedly and threatens me straight in the eye. We did not ask for a championship bout. It was him who came after the title. So yes, my eyes changed suddenly and I want him to understand that if I am smiling I am not there to laugh or give up my dream that easy. Q : What was the first thing that came to your mind when you felt Masio tapping and when Sheikh gave you the belt? A: I have often said, behind me is the person who believed in me before I even realized my abilities, my brother. My brother is my coach. When I take a jab he takes it too in his heart. Obviously I had to signal to my brother to reassure him as soon as I felt that Masio was going to give up. Hence I gave a thumbs up to my brother. When I submitted Masio, I was overwhelmed with a thousand sensations, and I think especially of the people who are dear to me. I felt their relief. I know it can be very hard for them when I get into the cage. For me time stops for them every minute becomes an eternity. When I received the championship belt from His Highness, time stood still and it symbolized the fruit of a lifetime of struggle and dreams. Q : Who named you “SMILE” ? A: Since I was a child, I was described as a rather smiling person. It’s true that I smile all the time despite myself without even realising it. My teammate – Kussay, gave me this nickname because I always smile. He told me that he never saw a fighter as happy as me, in the gym, in the streets, or inside the octagon. He said that “Smile” is a good nickname because it shows something different in the fight game: Positivity , Happiness and Respect. I don’t need to wear a mask or play a role. I smile because I am happy, and I smile bigger when I fight cause I know I can beat anyone. I smile because I love my job, I love representing my country, my team and also because I know Allah got bigger plans for me. Life is a test. I’m doing my best to be a better man. Q: Your father wanted you to become a football player right from your childhood, so after you stepped in home with the belt, what was it like? A : I know that he loves me deeply. I am very close to my mother and I know the anxiety she feels when I go to fight. I know that the love she carries for me is so great and supports me enormously. My father is afraid for my safety. When I brought back the belt they were all very happy. Many in my neighborhood gathered to watch the fight. Now there is a craze and a common sharing in the neighborhood to see me fight and come victorious. This belt may be mine, but it belongs to each one of them.